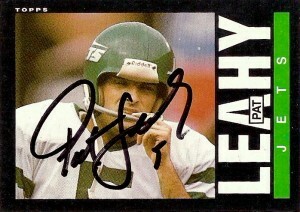 Pat Leahy was an ageless kicker for the New York Jets, that provided stability to the position for 18 seasons from 1974- 1991. He was one of the new breed of soccer style kickers (in the mold of Jan Stenerud), and after graduating from St. Louis University, (where Pat had not played football,) it was a whole new start for him under the bright lights of NYC. Leahy bridged many generations of Jets players (Namath to Nagle at quarterback), coaches (Buddy Ryan was his special teams coach, before there were ST coaches), and teams. He retired as the Jets All-time leader in scoring, and most games played. At one point he also made a team record 22 straight field goals which also stood for some 22 years. After the 1991 season he’d retire, as his back finally gave out on him. At the time of his retirement, he was ranked top 5 in career points. (He also made it into the digital age, appearing on Tecmo Super Bowl as the Jets kicker.) Pat has enjoyed his life since then thankful for the opportunity that NFL football gave him. He’s owned his own business and also worked for Home Depot for many years as a district merchandise manager.